Kerbal Space Program :: KSP 1.0 is Released! This is a special one! 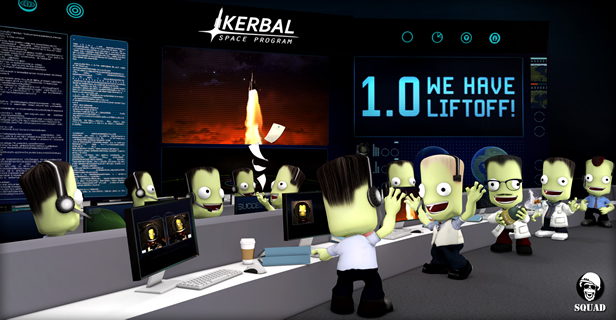 After four and a half years in development, Kerbal Space Program 1.0 is now officially released! The flight model has had a complete overhaul, meaning the lift is now calculated correctly to all lift-generating parts, which includes lifting bodies. The drag simulation has also been completely revised, and uses automatically pre-calculated data based on the each part’s geometry, to be finally applied based on not just the orientation of parts in flight, but also taking other parts into consideration. Stack mounted parts are now occluded from drag by neighboring parts, and lift induced drag is also properly simulated. Both the lift and drag are dependent on air density and the speed of sound, which are calculated from temperature and pressure. Be careful when flying aircraft in this new update: stalls are now properly simulated as well, and spontaneous craft disassembly during high-G maneuvers is now a very real thing. A new heating simulation has been implemented together with the improved aerodynamics. Now, not only temperature but also energy flux is considered when making heat calculations, meaning radiative, conductive, and convective heating and cooling are all simulated and all parts have their individual thermal properties. Parts will emit a blackbody radiation glow if they get hot enough. Although part temperatures can now be affected by such things as being exposed to sunlight and hypersonic flight heating, they can be properly occluded from these effects as well. Atmospheric temperature (and density) takes into account latitude and the position of the Sun. Celestial bodies now accurately emit thermal radiation that makes nearby craft warmer. Finally, ablative heat shields (with a finite, editor-tweakable ablation material) have been added to protect the parts behind them from reentry heating. You can now add fairings to your rockets! Fairing construction starts with a base part which will allow you to procedurally create a fairing after you place it. The design of the fairing is left up to you: shape individual sections of fairing with an intuitive visual system which gives you total control over the shape of any fairing. Once you've placed the fairings you can still edit your payload! Mousing over the fairing will make it transparent and will give you an exploded view, allow you to access anything that's inside. If you later want to edit a fairing, simply right-click the fairing base to modify it as needed. Fairings will shield anything inside them from drag and heat, making them an ideal tool for making payloads survive even more aggressive aerodynamic stresses. Like cargo bays and service modules, they will also prevent wings from generating lift, as well as science experiments, solar panels and antennas from deploying, which means all these new parts should be a big part of your mission design. Mining for Resources is now a part of Kerbal Space Program: set out to find Ore, which can be found throughout the Solar system, including on asteroids. To do this you'll have access to several different scanners to map out and find the best places to mine, drills to extract it, specialised holding tanks to store it, and a processor / refinery unit to convert it into usable fuels. To help you find the Ore, new map overlays have been implemented on all celestial bodies, and new UI elements have been added to various pieces of equipment. Also, Kerbal engineers are particularly good at keeping those drills humming at peak efficiency. There is a lot more we could talk about, but we’ll let you discover that on your own! The update is now available on the KSP Store[http//%26quot%3Bhttps], Steam[http//%26quot%3Bhttp] and GOG[http//%26quot%3Bhttp]. We hope you will enjoy Kerbal Space Program 1.0 as much as we enjoyed making it. 10... 9... 8... ignition seguence start... 7... 6... 5... 4... 3... 2 engine ignition... 1 relesing clamps... Lift-off of the Hype Bottle Rocket 1.0.0! you guys are the best people I have ever known I have over 1k hours of this game. @Penguini No. They gonna keep adding more features. Awesome, not like hot dogs awesome, but like original meaning Awesome! now.... i will buy the game.